“These practices are the central elements of worship: the preaching of God’s word, praying in accordance with God’s word, singing what coheres with God’s word, and seeing God’s word through the ordinances” (45). 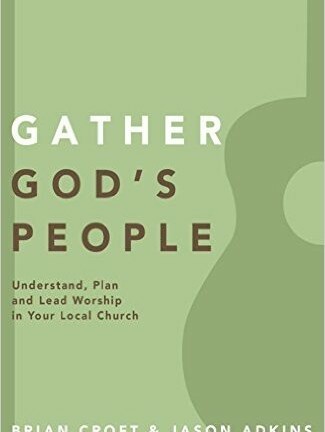 Brian Croft, Senior Pastor of Auburndale Baptist Church in Louisville, Kentucky, and Jason Adkins, Associate Pastor of Auburndale Baptist Church, made this statement in Gather God’s People: Understand, Plan, and Lead Worship in Your Local Church. Their purpose is to sharpen leaders’ understanding of biblical corporate worship in the local church. The authors attempt this by explaining in detail the regulated means of grace and demonstrating how these biblically mandated means should be used in planning and leading corporate worship. The book opens with an explanation of the theology, elements, and spirituality of corporate worship. Next, the authors provide a guide to planning worship through the reading, praying, and singing of the Word. It closes with a section devoted to leading readings, prayers, singing, and the ordinances in cooperate worship. Croft and Adkins explain how the reading of Scripture is an element regulated by the Bible. They state that “the New Testament, and specifically the apostle Paul, envisions God’s word audibly present throughout Christian worship” (33). The authors also explain how to plan this regulated element. They believe it is best for the readings to align with the sermon, and use a variety of “Testaments and genres” (59). The length of the reading and the congregation’s ability to link the reading with the sermon should also be considered. They also give advice on leading Scripture reading: “Whatever your church’s polity, the service leader should be recognized as a leader in the mold of Hebrews 13” (86). This gives the leader credibility to give instruction to the church. It is important that the leader reads “loudly, clearly, and slowly” (87). He should also understand the text pronunciation and sentence flow. Since God’s word commands the public reading of Scripture, the local body should include this element in cooperate worship. In addition to Scripture reading, congregational song is a biblical element of worship. The authors argue that “Scripture insists and informs congregational singing” (40). The congregation’s song should reinforce Christian doctrine and virtue, and it should encourage the church. In planning congregational song, the leader should attempt coherence with the sermon: “Song choices can drown out the message of the sermon or they can amplify the word based charge for God’s people” (74). It is mandatory that a song contain biblical doctrine, and articulation of the gospel should be considered in planning. The planner should also take into consideration the tradition of the church’s hymnody. To lead this element, the leader should be “affirmed by the congregation” and “gifted by God” (96). The authors believe that the song leader should be a man because it is a position of spiritual leadership. Ordination and affirmation help to bring authority to this position. Corporate prayer is also regulated in Scripture. The authors argue that “corporate prayer finds both its charge and content in God’s word” (37). Prayers should be offered for authorities, confession of sin, times of crises, and for conversion of the unregenerate. The authors’ church plans an opening prayer, mid-service prayer, offertory prayer, and concluding prayer. They plan a variety of prayers including pastoral prayers and prayers of confession. In planning the mid-service prayer, they attempt to align it with the sermon and consider the congregation’s needs. Clarity, projection, length, and speed are important in leading cooperate prayer. They state, “In order to make a prayer as clear and accessible as possible, service leaders should engage in at least some preparation prior to the service” (90). The authors thoroughly explain all the regulated elements of corporate worship. The large quantity of Scripture and the practical application to planning and leading the service accomplish their goal. Explaining the discipleship quality of congregational song could have strengthened their argument. The authors’ interpretation of hymns and spiritual songs as songs other than psalms (42) needs evidence. The claim that the music leader could be the duty of a deacon needs biblical support (96). This book would be a great asset to any involved in the planning and leading of corporate worship. A list of the appendices includes: “Reintroducing Psalm Singing,” “Psalms Set to Familiar Tunes,” “New Songs/Old Tunes,” and “Church Covenant Hymn.” This book is a concise guide to corporate worship, and it contributes to the fields of Christian worship and ministry.